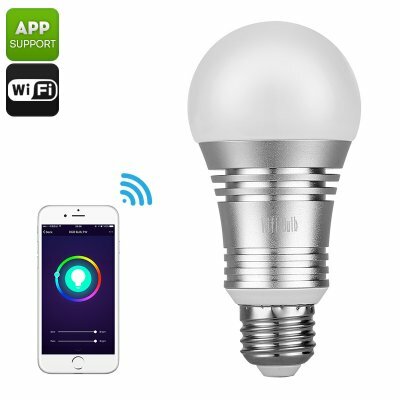 Successfully Added Smart WiFi LED Bulb - 600 Lumens, 16 Million Colors, Amazon Echo Compatible to your Shopping Cart. This smart bulb lets you control the lighting from your smartphone or through an Amazon voice-operated device such as the Echo or Tap. It is able to display 16 million colors so this mood light lets you set the atmosphere in any room. So if you want a reading light for your study, a warm glow for the living room or a romantic ambiance, this led bulb can do it all. Emitting up to 600 lumens of light from a modest 8 watt of power this LED bulb is highly efficient and with a 20000-hour life expectancy, it will easily pay for itself several times over by reducing your electric bill. An E27 screw fitting makes this RGB LED light suitable for most lamps and lights. The app operated bulb is can be controlled through a number of different iOS or Android apps so you will be able to control your lighting at the touch of a button, or if you have an Amazon voice-operated smart him hub you can use voice controls. This smart LED bulb comes with a 12 months warranty, brought to you by the leader in electronic devices as well as wholesale LED lights and lamps..